If you have problems with the activation and installation of your SCARM license key, read the possible causes and solutions below. If there is no answer for your problem or if you cannot reach us by e-mail, post a comment below and we will reply as soon as possible. Before continue, ensure that you have the latest version of SCARM installed. Use “Help” > “Check for Updates” menu command and if there is a newer version of the program, proceed with the update. If SCARM shows warning message that it cannot display the website of the program, there is a problem with the default browser in your system. The message offers you to send the license activation data manually. Press “Yes” and follow the instructions on the screen for manual activation of your license. There are no activation data sent to the server or the activation message is corrupted. Close all browser windows, restart SCARM and perform the activation procedure again. Ensure that you click with the left mouse button over the download link. Check your browser settings about downloading and storing files from Internet and where is the default download location as the file may be already downloaded, but without browser showing any notification. If that does not help, switch to (or install) another browser and use it to download the already activated license file. If SCARM shows error message about possible problem with the license key while trying to open a project file, this may be due to wrong or corrupted license in the system. Try the solutions in the answer below and read also the post The project files does not opening. This may happen when SCARM cannot verify the registration info on the server, probably because it is blocked by a firewall. Open the “Extensions” menu and if you see there “SCARM License Key (inaccessible)” that means a missing connection to the server. Please, check your firewall settings and rules and allow SCARM to connect to Internet. If you cannot solve that in the firewall menus and settings, temporarily turn off the firewall and then restart SCARM. This check is required only once after the license installation. If SCARM is set to work in Portable mode, the license will not work. To check that, open “Help” > “About” and see if “Portable” is shown just under the version number. If yes, go to “Tools” > “Settings” > “Portable” and press the button “Clear the local settings”. Restart SCARM and check again in “Help” > “About” that Portable is not present anymore. In some rare cases, the activation procedure may fail while registering the license on the server. Open the “Extensions” menu and if you see “SCARM License Key (outdated)”, your license should be refreshed and the download and installation should be performed again. Use “Help” > “License Activation and Installation” menu command again and login in your account. If the license shows “Requires refreshing” label next to the Ref No, click over the “Refresh” link in the Download column. 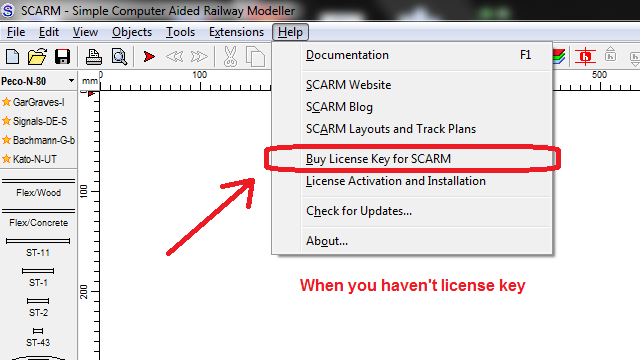 Then download and install the license key file again and restart SCARM. If you have more than one registered license, check that you are downloading the correct one for the given PC (the link for the correct license should be bold). Installing the wrong license (for another PC) will make it unusable as SCARM will not recognize the license key. In such case, download and install the correct license file for that PC. Perhaps, something is changed in your PC configuration and either the license file is erased or the license key does not match to your system anymore. Restart the PC, ensure that SCARM is not blocked by a firewall (see above answer), use “Help” > “License Activation and Installation” to login into your SCARM account and then check, refresh if needed (see above answer), download and reinstall the license file. If that does not help, contact us for further assistance. If the above advices does not help you to resolve your problem, write a message in the comments area below and we will reply as soon as possible. This entry was posted in Problems & Solutions by Milen Peev - Author of SCARM. Bookmark the permalink. I have tried to activate the key for the new version of SCARM, but have had no luck. I have downloaded and reinstalled SCARM twice and downloaded the key three times. (Firewall Off) I get a “successful” message after activation, but upon restarting SCARM it says license is outdated. I am running it on a Windows 7 64 bit machine. Any suggestions you have to resolve this issue? “Outdated” means that there may be some change in your system. Have you recently changed something in your PC, i.e. hardware component exchange or complete system refreshing like full Windows reinstall? Please, drop me an e-mail to and mention the purchase Ref. No. and I will check what could be wrong. I want to move my license to a different computer, but it seems like it does not accept it. Can you assist me? The license is intended to be used in a single PC and cannot be moved after already activated. There are some exceptions, i.e. if the PC gets broken shortly after the license is purchased and activated, so write to , note the purchase Ref. No. and explain your case. As SCARM runs well in this configuration, it would be crazy to get stopped because I can’t activate my purchase. SCARM License Manager is not yet compatible with Linux/Wine. I will work to test it and make it working there, but that will not be ready very soon, at least not in a month or two. If you haven’t access to a Windows PC where you can install SCARM and activate your license, drop me an e-mail and I will refund your money. Hi Milen, I basically did all my design with the beta version, and I am buying it to repay you for what looks to me like the best model railway design program out there, so I won’t be asking for a refund. I would like to do some tinkering though, so I do look forward to when you can get the linux activation going. I have some more thoughts about activation methods, so when I get some free time I’ll send you an email about it. Cheers Ron. Write to when you have time and share your thoughts. Is there an alternate method for registering the full version? My PC is behind a firewall administered by others, and I cannot disable it. I have put SCARM in the Exceptions list, but still no luck. No. The connection to the SCARM server for the initial registration of the license is a key point and cannot be bypassed. Try to restart your PC, then start SCARM and check the license registration status again. Sometimes the restart is required in order the exception to take effect. Ask the network administrator for help to ensure that SCARM can reach the webserver behind the firewall. As a last option, if this is a business (work) PC, I can reset the license in your account and you will then be able to register it in another (home) PC. That’s unfortunate, because all of my home PCs are Macs. Do you know whether SCARM will run under Parallels? Yes, SCARM runs fine with Parallels. Should I reset your license? Done. Install SCARM under Parallels and repeat the activation procedure. Let me know if it is OK or not. I recently paid for both a scarm license and MTS power edition and after downloading and installing these at first the license was recognised but after powering down my pc, on subsequent invocations I’m back to demo mode with extensions greyed out ? Have tried multiple repeat download-install-restart attempts with no success and my registered user module status is ticked o.k. I’ve made no changes to my pc (64 bit Win 10) but it is an AIO with detachable screen which communicates with the base unit via Splashtop wireless – would this be an issue perhaps ? I just checked your licenses in my system. It seems that both licenses were activated and installed on one PC (with Intel CPU), but then downloaded and installed again on another PC (with AMD CPU). The licenses will not work on the second PC. I am not sure if this is related to the detachable screen, but the licenses should work normally on the first PC where they are initially activated. If the licenses does not work even on the first PC, check if SCARM somehow was set in Portable mode – open “Help” > “About” and see if “Portable” is shown just under the version number. If yes, go to “Tools” > “Settings” > “Portable” and press the button “Clear the local settings”. Restart SCARM and check again in “Help” > “About” that Portable is not present. I have been trying to download the license key that I purchased, but I keep getting a window stating that “Internet Explorer cannot download acc.php from http://www.scarm.info.” It goes on to state “Internet Explorer was not able to open the internet site. The site is either unavailable or could not be found. Try again later.” I have tried this multiple times, but I still cannot download the license key. Is this the only way to obtain my license key? Please let me know what you can do to help me. Thanks. Your browser is trying to download the PHP processing script instead of the license file. This may be due some local cache conflict in your PC. I will work to resolve that today, by rewriting the cache headers, sent by the server. Meanwhile, you can try to use another browser, i.e. Firefox or Chrome. You must make the other browser default for the system and then to try the activation procedure again. Let me know if that helps – write here or by e-mail to . Buongiorno volevo sapere se una volta acquistata la licenza questa si può utilizzare sono su un pc perchè ho provato a scaricarla sul pc dell’ufficio e mi dice che l’installazione è completata ma quando riavvio il programma non si è installato. The license key is valid only on the PC where it is initially activated, downloaded and installed. I downloaded and installed SCARM 1.0 and paid for the license key. I downloaded the *.scpem file. I opened SCARM and went to the help menu. The License and Activation line is greyed out. Is there a special directory where the license activation key file is supposed to go? What am I missing? Please, open “Help” > “About” and see just below the version number – is it written “Portable” there? If yes, go to “Tools” > “Settings” > “Portable” and press the button “Clear the local settings”. Restart SCARM and check again in “Help” > “About” that Portable is not present. The SCARM worked at friday morning and stopped working at the same day afternoon. Nothing changed in my pc. I have a similar problem like Ron. The SCARM worked at friday morning and stopped working at the same day aftrnoon. Nothing changed in my pc. WIN 7 x64 running on it. Ron has installed the new SCARM 1.0.0 under Wine and the licensed version never worked there as for now it is not possible the license to be activated in Linux. Are you trying to do the same (run SCARM 1.0.0 in Linux/Wine) or you have another problem? If you have another problem, please, restart your PC and then try to download and install the license again in SCARM. If that does not work, write here again. I’m using the scarm on Win 7 x64. I tried to reinstall and reactivate it several times. No luck. OK, I will reply by e-mail as I will need several screenshots from your system. I checked your account and your SCARM license key seems to be properly activated in the system. If you have problem with the downloading, please, try to use a different browser to login into your account and download the license file. As it is already activated, you do not need to login from SCARM, just login from here: http://www.scarm.info/acc.php. I have just updated and purchased the new version and the road option does not appear on the track panel. Please advise. Wie bekomme ich mein Geld zurück? Die Software lässt sich nicht aktivieren auch bin ich mir nicht sicher ob nicht nach der Aktivierung wieder nach einer gewissen zeit Geld verlangt wird leider ein nicht durchschaubares Angebot aus Bulgarien ich habe ja noch Win Track Gott sei dank das funktioniert und ist billiger auf die Dauer. Let me know what is your purchase Ref No in order to check the license in your account. Let me know also what is the problem with the activation and I will then be able to help you. Is there any error message during the activation process or what? 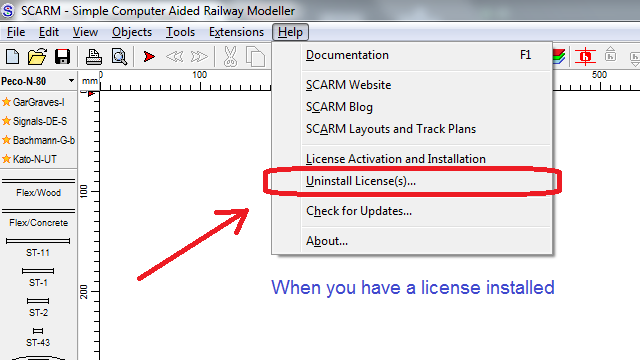 I just checked your account in the system and saw the you purchased a license for Model Trains Simulator – Power Edition for SCARM. This license allows you to use the MTS PE extension with up to 5 locos and 50 cars per simulation session in SCARM. However, this license does not unlock the full editing capabilities of SCARM main program. If you want to edit track plans with unlimited number of tracks, objects and layers, you need to purchase and install SCARM License Key. Do you have any student discount option? No, currently there are no special discounts for students. Hello, i have download the software 1.1.0 and bought the license key…. i install as required with HELP- LICENSE ACTIVATION AND INSTALLATION but i always get an error…. I already resart my computer but i get the same error…. In the EXTENSIONS says LICENSE KEY OUTDATED…. Yes, I saw the problem with your license in the system. The issue is that your PC reports some required data very slowly and the license key cannot be properly initialized during program startup. I will write you by e-mail in order to solve that problem. I didn’t see that this is not yet compatible with MAC. Do you have an ETA? There is no ETA for the Mac compatibility, but check regularly in the blog – I am working over this and when get satisfied results I will announce about that here. I bought a new pc. I set my old pc to factory settings erasing SCARM on it. The old pc license does not work on my new pc. Do I have to buy a new license or is there another solution? I will reply you by e-mail. Hello,I got a same situation as Mr.Torres. This error show up everytime. Yes, the problem is similar, but not the same. I needed to reset the license in your account. Please, perform the re-activation, download and installation of the license key again. That should fix it. Yes, the license was incorrectly registered in your account, so I needed to reset it manually. Please, perform the activation, download and installation again. Sorry for the inconvenience. He comprado la licencia hace poco de menos de un mes aproximadamente y la he instalado y ejecutado sin ningún inconveniente en mi antigua máquina. He desinstalado el programa para instalarlo en otra máquina que e comprado pero la licencia sigue en uso. I already replied to your message, that you sent by e-mail. I have a multi-boot computer that I have iterations of different Windows version installed (7 & 10), and I have seen that I am able to install and activate SCARM on the different iterations (same computer/hardware). I assume that ability is because the license key is matched to the hardware. I also will be using SCARM at my other seasonal residence. I never use the two locations simultaneously, and by reading previous posts, uninstalling SCARM at one location will not allow its use at the other location, since that computer has a different hardware signature. Is my only option at this point to purchase a second license for that second location? Yes, you will need a second license for the other PC. I will give you more details by e-mail about that. Hello Milan – I have installed and licensed SCARM on my laptop. Do to some work I need to do I need to install Linux on my laptop, and will reinstall Windows 10 in VirtualBox. Will I be able to re-install SCARM in the Windows 10 VM with the same license on the same PC? I did not tested that and I am not sure whether and how it will work regarding SCARM license. VirtualBox may replace some hardware components with its own virtual drivers, so if you encounter problems with your license key, write to and I will help you. I’ve installed Windows 10 over Vista 64 on my machine. I reloaded Scarm. Now under Extensions, the License key says it is OutDated. Now what? Perhaps, your license needs to be updated too. Use “Help” > “License Activation and Installation” command, login in your account and if you see “Refresh required” label next to your license, use the Refresh link and then download and reinstall the license file. I see a rename, not a refresh. I tried that and did the download and installed it. No change. I checked your account and found that you used SCARM on a virtual machine before and now you are trying to use it in a real Windows environment. That changes the whole license key and requires license reset, that I already did for you. Please, re-activate, download and install your license key again. That will fix the problem. Please, check your e-mail – I already replied there. I go between my laptop and a pc. I have Scarm on my pc but I want to run it off my laptop but I can’t get it to register with my license key. I saved the program file to my thumb drive and uninstalled it on my pc. Can I not do this? You may need a second license if you want to use SCARM on two devices. I will write you by email with more details about that. Great program, Milen! Thank you for your work on this! So I bought your code last year, and around last Christmas I had to swap motherboards because when I upgraded my CPU, the pins on the old motherboard got bent and I had to RMA my board. I’m guessing this license is either relying on the same motherboard or combination of cpu + motherboard. When will the software be updated with the Faller Laser Street system as the AMS is no longer used? Faller Laser Streets system has a special way of joining that right now cannot be properly represented in SCARM, but I will work to implement this system in some of the future versions of the program. I bought a license and activated it. Unfortunately I can’t open a project. An error message appears. The Linked Solution does not help. Too bad that the registration is so complicated, a license key would have done it, so they are always dependent on your support. In some rare cases, the activation process may not be fully completed and the license needs to be refreshed. That is explained in the answer of Question #6 above. There is nothing complicated, you just need to do the activation one more time and the problem will be fixed. I have just updated to version 1.3.0 and on doing so it doesn’t register my license key and says it is out dated. It seems that you have installed v. 1.3.0 on a completely different PC. In order to transfer the license, you must first uninstall the key on the old PC, using “Help” > “License(s) Uninstall” menu command and then you will be able to re-activate and install it on the new PC. Sorry for the translation. After installing the Model Trains Simulator Power Edition extension and downloading different locomotives and wagons, the simulator worked perfectly the first time. After closing the program and reopening, the simulator stopped working. 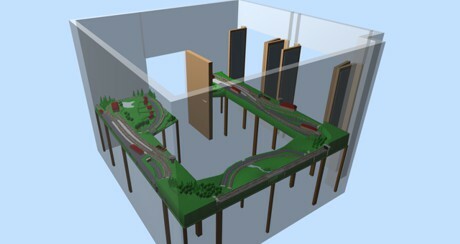 In the extensions menu, the following message appears: “Model Trains Simulator (inaccessible)”. Please help me. Problem solved. I had problems with the internet connection. Once connected, I was able to use the extension normally. Thank you anyway. OK, I am glad that you solved that. I do a bit of traveling. I have scarm installed on 2 computers. one at home and a laptop. I have 1 key. the laptop I take with me traveling. is it ok to uninstall and reinstall the key multiple times so I can work on my layout when I am not at home? I recently purchased a new computer and installed the newest version of SCARM on my new PC. I tried to activate the license on the new PC and the Extensions menu shows SCARM License Key (outdated) Can I transfer the license key from my old (now unused) PC to the new one? Yes. Start SCARM on the old PC and use “Help” > “Uninstall License(s)” menu command in order to uninstall and unlock your license on the server. Then start SCARM on the new PC and use “Help” > “License Activation and Installation” menu command in order to re-activate, download and install the license on the new PC. One license can be installed on one PC. If you want, you can move the license on another PC, but you need to uninstall the license from the first PC using “Help” > “Uninstall License(s)” menu command. The text command in my edit box disappeared! How do I get it back? The “Place Text” menu command in Edit menu is hidden when SCARM is in simulation mode. Stop MTS or restart the program to bring the command back. SCARM does not use activation codes. Instead, you should download and install your license key as it is described in the instructions, received in the purchase confirmation e-mail. Bought Oktober 28 a new gaming computer (AMD Ryzen 7, 16GB, 250GB SSD + 1TB HDD), downloaded and installed SCARM, tried to use license key I bought September 17, 2018 but keep getting “SCARM license Key (outdated). I have used SCARM on the previous PC but cannot remember if I used the license key on that pc already. The license key for SCARM can be installed and used on a single PC only. If you wish to move the license to a new PC, you must first uninstall the license key from the old PC by starting SCARM on it and using “Help” > “Uninstall License(s)” menu command. Then you will be able to re-activate and install the license on the new PC. Please, write by e-mail your purchase Ref No or registration e-mail and I will check your account in the system. If you can see the new camera options, then the MTS Power Edition is installed and working. However, it does not automatically install all the virtual trains from the Rolling Stock database. How to download virtual locomotives and wagons for MTS PE. Buona sera, ho installato la licenza ma all’atto operativo trovo che mi va tutto molto lento. Vorrei sapere se è normale oppure dipende dalle dimensioni del tracciato, cioè se il tracciato è piccolo allora tutto è veloce, se il tracciato è molto grande allora tutto diventa lento, grazie per la risposta. The speed of operations while working in SCARM depends on the PC (i.e. the CPU speed) and also on the size of track plan. It is normal bigger and more complex track plans to perform slower. In order to improve the speed, read the following blog post: How To Speed-Up SCARM. I have installed a new copy of SCARM 1.4, however i cant get the License activition to work. The SLK.scpem is greyed out and there is an error message ‘no Activation data’. In order to install the license key, start SCARM and use “Help” > “License Activation and Installation” menu command – that should open the default browser where you will be able to login into your account and then to download and install the license key. I guess I got the same problem like Hugh Tulloch or at least something similar. I’m too using PlayonLinux with Wine for running SCARM. Did work fine with 1.2 and my License. But I had to upset my system again and did update to a newer Linux-Version. It`s still the same hardware (for the exeption of a new hdd and a new PlayonLinux virtual drive in which scarm is installed), I could download the license file flawlessly. Installation looks fine but as soon as I open a file with more parts than allowed in the freeware version I get an error message. I guess, that SCARM does not “know”, that it is still on the same system and therefore produces trouble. Your problem is different and is related to the Linux upgrade. I will write you by e-mail about how to solve it. I got another computer and want to install the licensed version of SCARM on it. But the program keeps telling me I reach the maximum number of rails. How do I transfer the license? If you want to move the license to a new PC, you must first uninstall the license key from the old PC by starting SCARM on it and using “Help” > “Uninstall License(s)” menu command. Then you will be able to re-activate and install the license on the new PC. Thanks for your reply. I didn’t uninstall it yet on the old laptop. So, I guess it’ll work after that. Sorry to say that after removing the lisence from my old laptop. I didn’t manage to get it activated on my current laptop. As you can see I downloaded the SLK.scpem file to my local download map. My track in scarm gave the same message “I reached the maximum amount of rails, and was suggested to buy a lisence”. I cant open thefile localy, cause it demands an app to open it. Can you tell me what I’m still doing wrong? After re-activation and download of the SLK.scpem file, you must install it on your PC. Just double click that file and it will start the SCARM License Manager. Confirm the installation of the license key and you should see a message saying “The SCARM license key is successfully installed”. If the program is open, restart it and that will complete the installation process. If then SCARM still asks for a license, write to me by e-mail to and I will help you. Does the uninstall license menu remove from the currently installed pc and can be installed on another computer? Yes, “Uninstall License(s)” menu command removes the license key from that PC and then the license is ready for installation on a new PC. Sorry to have to get back to you once more. I cant run the .scpem file by double clicking. This because the “very practical” Windows 10 insists that I run the file through a standard app. I looked for the window with the promt command but they must think we dont need that anymore. How do I get round that? When you double-click the .scpem file, it should be automatically opened in SCARM. If that does not happen, you can open it manually: start SCARM, use “File” > “Open” and in the bottom of the Open dialog box, select “Files of type: All files (*.*)”. Then navigate to the folder where the .scpem file is saved, select it and open it. Thanks. It’s working perfectly again. I can continue to plan my track. I paid for the license, downloaded it and do not see any difference in the menu items available. What are the differences to the menu that I should be seeing? You can also open “Help” > “About” and see if your version is registered (licensed) or not. Thanks for the response, I did see the “uninstall line”–I guess I was expecting more content when I paid for the license. How does buying the license benefit me? Your homepage describes the use of semaphores and light signals but when I follow the help suggestion there is nothing there. How do I use that portion of the software? Will there be an addition of wiring to this software so you can plan your wiring scheme as one of the layers? I would like to “see” if the planned track fits well into its allotted space in the room it will occupy. Can this software accommodate this? 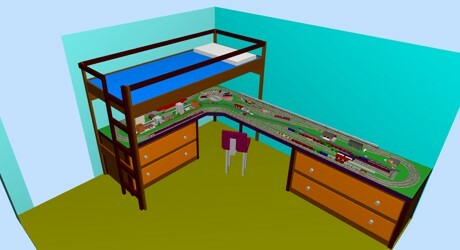 Can you add the room along with the track layout and table border? The most important benefit that you get with a license (and that cannot be seen directly in the menus) is that you can use unlimited number of tracks, objects and layers in your SCARM projects. Otherwise, you are limited to only 100 tracks/objects per project and up to 5 layers. All differences between the free and paid versions of SCARM are described in the Feature comparison table here: http://www.scarm.info/index.php?page=extensions&ext=scarm_license_key. I don’t know why placing of semaphores and light signals does not work for you, so please, read again the help topic How to place railway signals and try again. If you still have problems, drop me and e-mail to and I will help you. If you want to add wiring directly in the plan, read Adding Wiring Diagrams to SCARM Track Plans article here in the blog. 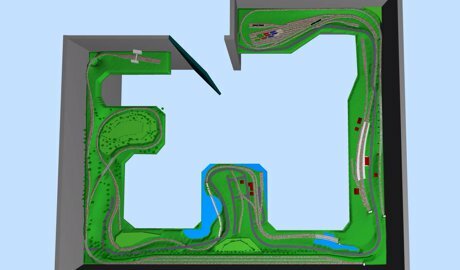 See all these layouts in SCARM Layouts & Track Plans website. Creating of such detailed layout projects is possible only in the paid version of SCARM and requires reading of all help topics and almost all of the tutorials, tips and tricks, posted here in the blog in order one to be trained and become expert in the layout design process with SCARM. I bought a license, but i have a desktop and a laptop. Can I not install the same license on both? Also, what happens if I need to move the license if not? One license covers only one PC. There is no way one license to be used on both devices, so you need to decide where you want to use it – on the desktop, or on the laptop. In case you already decided and then want to move your license to the other device, start SCARM in the PC where the license is installed and use “Help” > “Uninstall License(s)” menu command – then you will be able to re-activate the license on the other PC. Ok, Thank you! I will need to move it at some point once I fully transition to the other machine but for now I will leave it where it is!